"I got this recipe from a friend about thirty years ago. It has become a family favorite. It makes a lot, so it's great to serve to a crowd. Also, it can be made ahead and re-heated very easy. The original recipe calls for regular pork Italian sausage, but to cut down on fat, I use the turkey kind." Pour the tomato soup, tomato sauce and tomato paste into a slow cooker, and stir to blend. Crumble in the sweet and hot Italian sausages. Cover, and cook on low for 4 to 6 hours, stirring occasionally until the meat is cooked through, and the sauce is flavorful. When the tomato sauce is almost done, bring a large pot of lightly salted water to a boil. Add the mostaccoli pasta, and cook for 8 to 10 minutes, until tender. Drain and rinse. Preheat the oven to 375 degrees F (190 degrees C). Coat a 9x13 inch baking dish and an 8x8 inch baking dish with cooking spray. Layer the noodles and cheese in the two dishes to an even depth ending with cheese on the top, splash a little bit of the milk over each layer of cheese as you go except for the top layer. Bake for 15 minutes, or until cheese is melted and a little brown on the top. Cut into wedges, and spoon the sauce over them to serve. If you use regular pork sausage, you need to brown a little first to remove some of the fat. Also, the sauce can be cooked on top of the stove. But it burns easy, so you have to keep a close eye on it. It only takes 1 hour on the stove. This recipe was a nice change from just regular spaghetti and tomato sauce. My 8 year old loved it. Excellent! Also works great to make a big batch, and freeze portions for lunches. This makes a huge amount even if you half the recipe! It was very good. 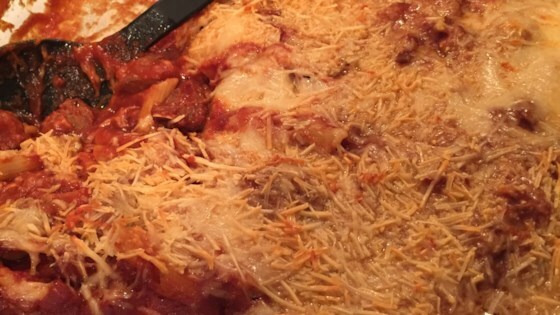 We liked the texture of the baked pasta. Will definitely make again. This was pretty tasty. I used mozzarella and cheddar. I just don't see how you can go wrong with that much cheese and italian sausage! EXCELLENT!!! Even my picky eater kids liked this one!